Notes: The first and unequalled (over 60% market share). The most widely distributed. Product synonym. Quality of the selected pigments. Greater consistency of the matter released. Smooth grip that does not scratch the shoe. This product is also available in black, brown, suede, for impregnated leather and skins and neutral. Take the sponge from the cardboard box without throwing it away (it will be useful in the future for keeping the product properly and recognizing it immediately). Remove the sponge from the transparent tray and pass it over the shoe leather with medium pressure. The shoe will be recoloured perfectly, the scratches will be filled and the surface of the leather will be smooth again. The shoe will be shiny immediately after use but the shiny effect will disappear as soon as the product dries. If, on the other hand, you want to maintain this effect, polish the surface with a soft cloth after letting the product dry. If there are coloured inserts, remove any white smudges using a soft cloth. It is recommended that you wait for about 12 hours before wearing the treated article. Leather and fabric coloured other than white, suede, untreated leather or nappa, nubuck, peccary, alcantara. 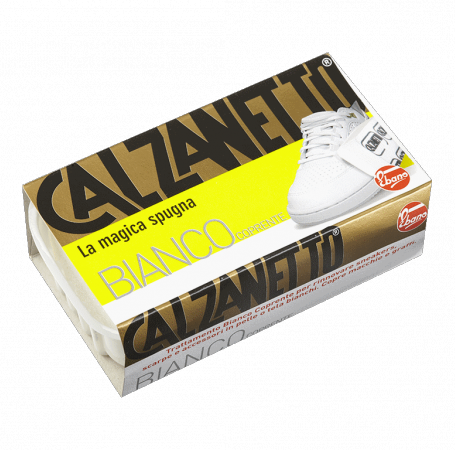 Thanks to its pigmented components, Calzanetto Coating White makes it possible to redistribute a white layer on the treated surface so as to make it uniform and homogeneous like new. Repairs scratches and covers stains.